1. In a skillet, melt the butter (or heat the oil) and add the onion. Stir to coat onion before adding honey, vinegar and a sprinkle of salt and pepper. 2. Sauté over medium high heat for 5-6 minutes or until golden. 3. 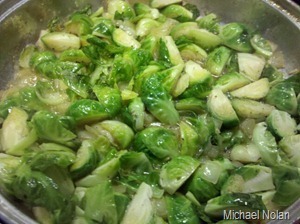 Add Brussels sprouts, stir and sauté until slightly browned. Add water and continue cooking until most of the water has reduced. Season to taste with salt and pepper and serve.